The Arnold School’s Department of Communication Sciences and Disorders (COMD) is thinking ahead—way ahead. Even though many university departments within the COMD field do not offer undergraduate degrees—only graduate-level programs—this forward-thinking department is looking for future students who currently aren’t old enough to drive. “Unless they have seen family members or have personally experienced communication problems, many middle and high schoolers are not yet familiar with the COMD discipline,” says Clinical Associate Professor Angela McLeod. “It’s important to spark the interest at an early age to help them become aware of the possibilities in this growing field.” By engaging their interests early on, these potential students are more likely to pursue undergraduate degrees with master’s level COMD programs in mind. It’s important to spark the interest at an early age to help them become aware of the possibilities in this growing field. This summer, COMD faculty and staff offered future students the chance to learn more about the field by partnering with USC Continuing Education Programs’ Carolina Master Scholars (CMS) Adventure Series. Now in its 14th year, USC established CMS to bring together academically talented middle and high school students from across the country to experience college life and explore careers in a fun, interactive learning environment. As a bonus, the program serves as an effective recruitment tool with former participants frequently declaring majors in the areas they studied through CMS. McLeod and Assistant Professor Dirk den Ouden organized the program on the COMD side, resulting in a program titled Adventures in Speech Pathology-More Than Just Talk. McLeod came up with the idea to participate in CMS when she saw a flyer for other health sciences courses. 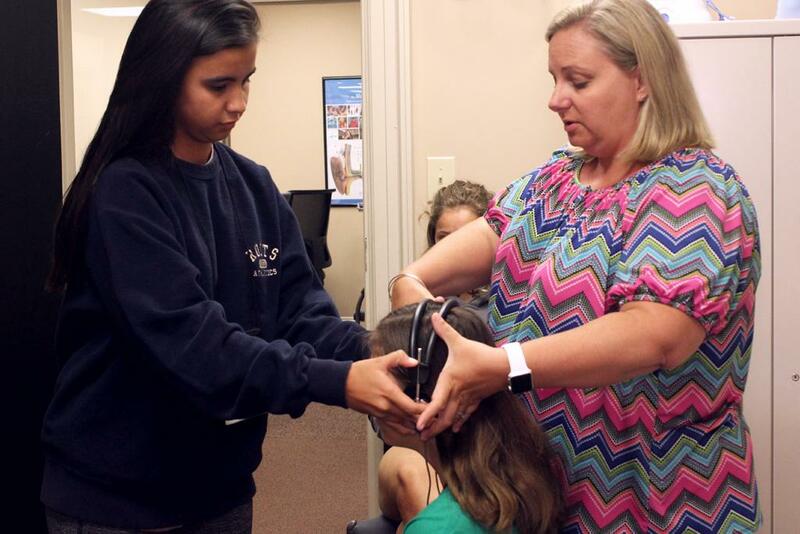 While occupational therapy and physical therapy were covered in some of the course content, she noted that speech-language pathology was absent. “Many people don’t realize that speech-language pathologists are an important part of the interdisciplinary teams that are becoming more common in health care settings,” says McLeod. This growing trend, which provides improved patient outcomes, is why the COMD department is a leader in providing interprofessional practice opportunities for students in the health sciences. When McLeod contacted the Continuing Education Programs to inquire about providing materials so that speech-language pathology could be included in the existing courses, she connected with Program Manager Meredith Higgs. Instead of merely adding a small section to an existing course, Higgs encouraged McLeod to consider developing an entire week’s work of programming around speech-language pathology for CMS. The students were always super excited about the class topics that they had learned, and they talked about how fun it was to work with the hands-on activities for the class and have different topics and speakers each day. The Adventures in Speech Pathology-More Than Just Talk module was open to 9th-12th graders and gave 10 students (a great turnout for a new course, according to Higgs) a crash course on topics, such as acoustics, bilingualism, hearing, speech, cochlear implants, child literacy, fluency, and speech sound production. While the one-week program [pdf] did not allow the COMD instructors enough time to cover all of areas within their diverse and expanding field, the deep-dive into select aspects gave future students a better understanding of what COMD coursework and careers entail. To narrow the topics down into a packed one-week schedule, McLeod and Den Ouden asked for faculty volunteers who would be willing to share their expertise with students. “Ten instructor or instructor groups generously volunteered their time to share their knowledge, and we ended up with a really diverse set of subjects for the students,” says McLeod. With a hands-on approach that aligns with both the CMS program and the COMD field, McLeod and the team provided an array of experiential learning opportunities throughout the week. 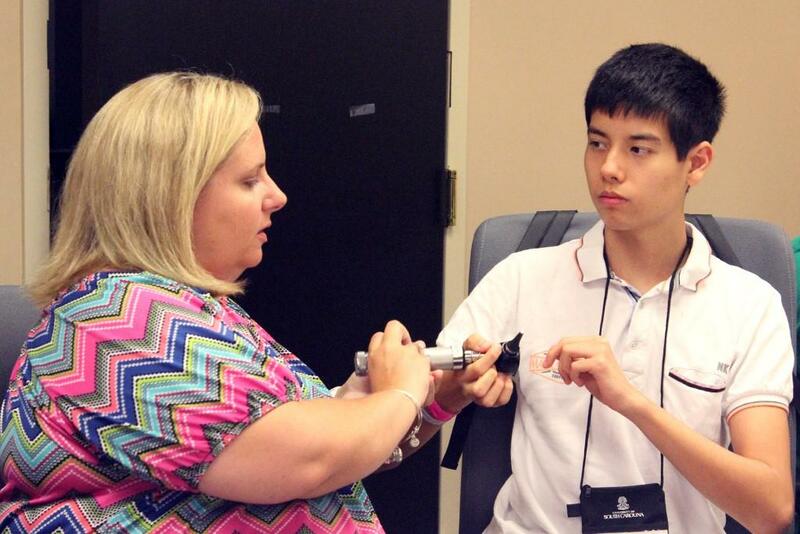 Students generated a synthetic valve using computer software, recorded and analyzed their own voices, visually inspected each other’s ears, learned how to operate audiometers to present tones and evaluate hearing, took dialect identification quizzes, completed phonetic transcription activities, and gave speech-language screenings to one another. Higgs confirms that the course was definitely a success, not only because of its impressive first-year enrollment but also based on the daily feedback she received from participants. 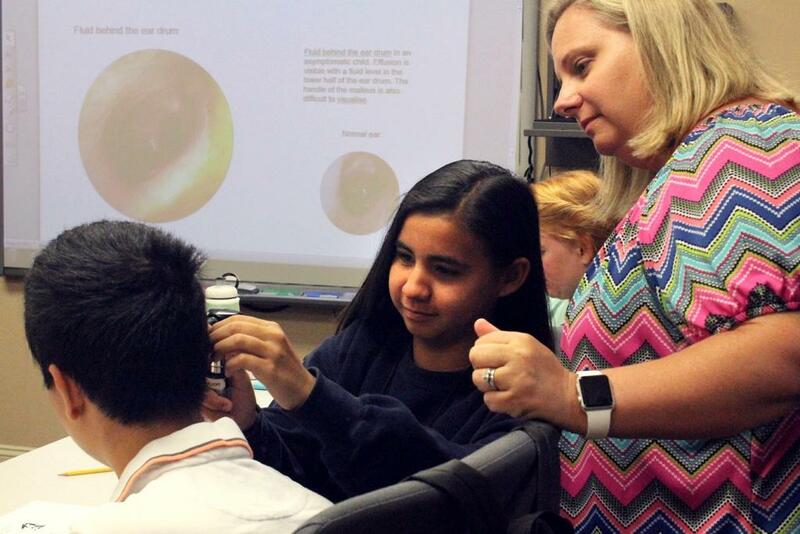 “The students were always super excited about the class topics that they had learned, and they talked about how fun it was to work with the hands-on activities for the class and have different topics and speakers each day” she says. “You could tell how much they enjoyed the class by looking at the excitement in their eyes." 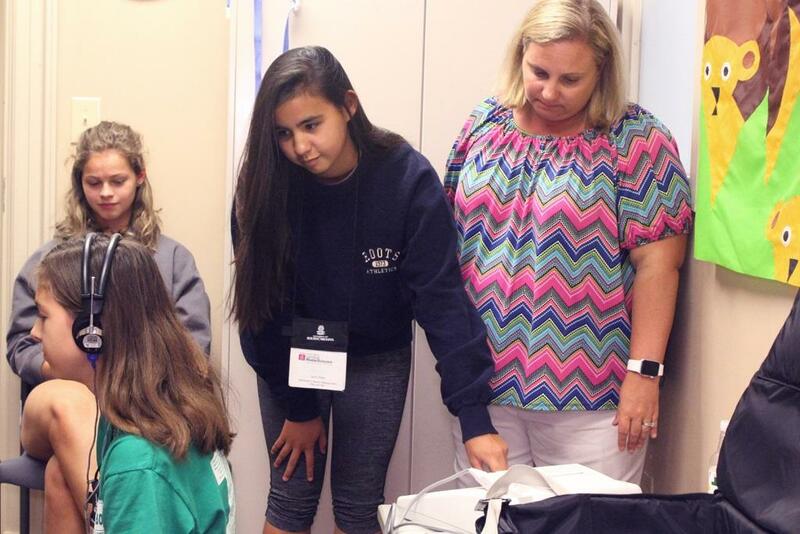 The Department of Communication Sciences and Disorders (COMD) participated in the Carolina Master Scholars Adventure Series this summer, giving high school students a crash course on speech-language pathology and recruiting future COMD students.